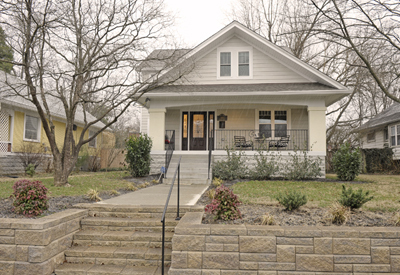 1816 Speed Ave Louisville, KY 40205 is now for sale - totally renovated and updated in the Highlands! Posted by Martin Crane on Monday, January 30th, 2017 at 10:30pm. 1816 Speed Ave Louisville, KY 40205 has just been listed for sale by Crane Realtors®! This is Just Listed and Open Saturday February 4th 2-4! What an amazing opportunity to own a FULLY RENOVATED home in the Highlands! With all of the features you'd find in new construction in the East End this 97 year old home has the exterior charm of yesteryear and the interior features today's new construction! This home has it all and was stripped to the studs! It now has an incredible open floor plan and on the first floor a front entertaining living room, formal dining room, huge eat in kitchen with beautiful cabinetry and soft close everything, top of the line appliances, counter seating for four, hearth room open to the kitchen with an efficient gas fireplace for the cold nights, first floor master suite with trey ceiling and another gas fireplace, a master bath that feels like you've stepped into a spa with dual sinks a powder area a jetted tub and walk in shower, huge walk in master closet, dual accessible laundry from the master bath and hall, and half bath for guests! The second floor has 3 additional bedrooms, den or media room, big hall closet, and another full bath! Off one of the bedrooms is an unfinished room of about 120 sq. ft. that could be finished out for a closet, kids playroom, or an office and it's foam insulated! There is pull down access to the attic that has another unfinished 713 sq. ft. of potential usable space for storage! This home has it all, granite and stone counters, Advantium oven, updated windows, updated electric, updated water heater, updated DUAL HVAC, updated, updated, updated!! There is even a basement which offers even more storage and an area that would make a perfect wine cellar! The back yard is HUGE with a concrete patio, a partially covered porch, fenced with a wood privacy fence, and an oversized parking pad with plenty of room for 2 vehicle's. Seller's state they will not respond to offers until 8PM following the open house Saturday. Viewing instructions - Open each image one at a time, click or press and hold (touchscreen devices) and drag to control viewing up down left and right. Be sure to close each image before viewing the next. Money saving tips for home buyers! My home inspector said WHAT? Receive a free market analysis of comparable properties in Louisville and surrounding areas.